Nicolas Maduro’s Venezuela erupts in violence: The Venezuelan president appears to have ordered a national crackdown on protesters. Hugo Chavez may have spewed hate, but he always kept a lid on repression. That may be over now. Supporters of opposition leader Leopoldo Lopez during a protest against Nicolas Maduro’s government in Caracas on Feb. 19. The tremors have been building for years, but on Wednesday night Venezuela was convulsed in a wave of violence as the government of President Nicolas Maduro appeared to enforce a brutal crackdown on nationwide protests. Streets were filled with tear gas and the crackle of gunfire, as National Guard units and National Police came out in force. Bands of regime supporters—paramilitary gangs known as colectivos—swarmed neighborhoods and public squares on their motorcycles, firing live ammunition at anyone who remained in the open. Some stormed into apartment buildings in search of protesters. The crackdown extended from Caracas to Maracaibo, Maracay, Valencia, and nearly every major city across the South American country. Venezuela’s cities have become notoriously dangerous in recent years, as the country’s crime and murder rate soared. But on Wednesday, Venezuelan cities weren’t simply dangerous; they were a war zone. As startling as the violence itself was the fact that the government gave no warning or explanation in advance. In a rambling national address earlier that day, President Maduro spoke of the need for peace—then praised the work of paramilitary thugs and promised to target members of Popular Will, a leading opposition party. Its leader, Leopoldo Lopez, was spending his second night in a military prison, after surrendering himself to authorities on Tuesday to face trumped-up charges implicating him for the death of three Venezuelans at protests. Even if Lopez, one of the opposition’s best-known leaders, is imprisoned, Maduro isn’t acting like the man with the upper hand. In his remarks Wednesday, he seemed erratic and unsure of himself, which only fuels rumors that he may have diminishing control over the state and its security forces. The most focused target of the regime’s repression has been the Popular Will party. Lopez is being held in the Ramo Verde military prison, a small facility that sits on a mountainside about an hour outside of Caracas. The remote prison has held other high-value political prisoners during Chavez’s years in power. On Tuesday, security personnel raided the Popular Will party’s headquarters in search of their second in command, Carlos Vecchio. Vecchio, a lawyer and activist, has been forced to go into hiding, and on Wednesday President Maduro confirmed that a warrant had been issued for his arrest. There were also unconfirmed reports that a warrant would soon be released for David Smolansky, the next highest party leader. A senior member of the party confirmed Thursday morning that most of the party’s top leadership has either been detained or gone underground. That may be the key difference between Venezuela today and before: For all of the combative rhetoric and venom spewed by Hugo Chavez, the Comandante always kept a lid on widespread repression. The late strongman was expert at verbally provoking and demonizing his opponents, but the threshold for a large-scale crackdown was never crossed. Chavez would unsettle his enemies, entertain half measures, or defuse a situation by simply directing his abuse at a wholly new target. But Maduro has never possessed his predecessor’s confidence, communication, or political canny, and he inherited a government rife with factions. Since his narrow election last April, the fear has been that Chavismo’s odd blend of bravado and insecurity would swing wildly in his hands, especially as the country dire economic conditions worsened. Early Thursday morning, a senior adviser to a Popular Will party leader described the situation as “extremely fluid,” before expressing surprise at Maduro’s decision to ramp up the confrontation. “The government keeps upping the ante,” he said. The government is likely reacting to the wave of spontaneous protests that have broken out across the country since peaceful demonstrations devolved into violence on Feb. 12. Those protests had been called in part because of the country’s economic freefall. The oil-rich country has been racked by inflation of nearly 60 percent. Venezuelans have suffered shortages of basic foods, goods, and medicines for years now, but December and January saw new levels of scarcity. The government now admits that 1 in 4 basic goods is out of stock (which means, in truth, it’s much worse). The situation is so bad that three airlines now refuse to fly there: The government owes them too much money. But Wednesday night’s crackdown was perhaps the most violent encounter between the Venezuelan government and its people since protests and riots racked the country in 1989. Chacao, a wealth district of Caracas, saw intense fighting, with protesters throwing rocks and Molotov cocktails at National Guard units who fired tear gas canisters and buckshot. San Cristobal city saw some of the heaviest clashes, and President Maduro even threatened to have the mayor, also a member of the Popular Will party, thrown into prison. Perhaps most frightening are the gangs of paramilitary fighters who flood neighborhoods on the motorcycles and appear to act with impunity and government support. Venezuela now even has reports of torture. 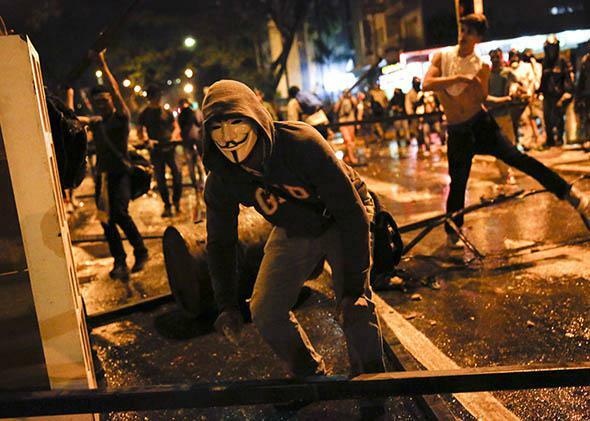 Chavistas have long raised the specter of civil war if political contests didn’t go their way. Chavez regularly implied there would be blood in the streets if he didn’t win this election or that referendum. It was extraordinary thing to say, especially since it was Chavez who had worked so hard to polarize the country in the first place. He once threatened, “If the oligarchy is allowed to return to power, I might end up letting the … tanks out to defend the revolutionary government and the people.” When Chavez engaged in this type of loaded, high-stakes talk, it was part of his strategy. When Maduro does, it’s part of his weakness. Also in Slate, the latest photographs from the violent clashes in Venezuela.